CINCINNATI -- Americans gave a whopping $410.02 billion to charities in 2017, according to a new report from Giving USA. But don’t think that means your favorite local charity or religious organization is flush with cash. Last year’s biggest charitable gifts went to big nonprofit organizations, such as universities, hospitals and foundations, that have robust fundraising departments, said Melissa Brown, a leading researcher in philanthropic giving and principal of Melissa S. Brown & Associates. Brown was in Cincinnati Tuesday morning for the 15th annual local presentation of Giving USA’s annual report on charitable giving. The local presentation, organized by The Yunker Group , is important to help local funders and nonprofit organizations understand the big philanthropic picture, said Jim Yunker, The Yunker Group’s president and CEO. Giving USA 2018: The Annual Report on Philanthropy for the year 2017 noted that last year was the first time charitable giving topped $400 billion in the United States. • Giving by individuals represented 70 percent of total giving. • Giving by foundations has shown strong growth for the past seven years. • Corporate giving was bolstered by $405 million in contributions related to disaster relief. • Foundation giving increased 6 percent to an estimated $66.9 billion. • Bequests totaled $35.7 billion. • And corporate giving totaled an estimated $20.77 billion. Despite the big national numbers, giving to local nonprofit organizations is more important than ever, said former United Way of Greater Cincinnati CEO Rob Reifsnyder. That has charities scrambling to reach the people that care about their missions and can give even small amounts to help keep them going. The Giving USA numbers could seem intimidating to people and families that do their charitable giving $25 or $100 at a time, but Yunker said they shouldn’t. Even small gifts, he said, matter a lot to the nonprofit organizations that receive them. The fact that individual giving makes up the majority of philanthropic gifts in the U.S. surprises people ever year, he said. 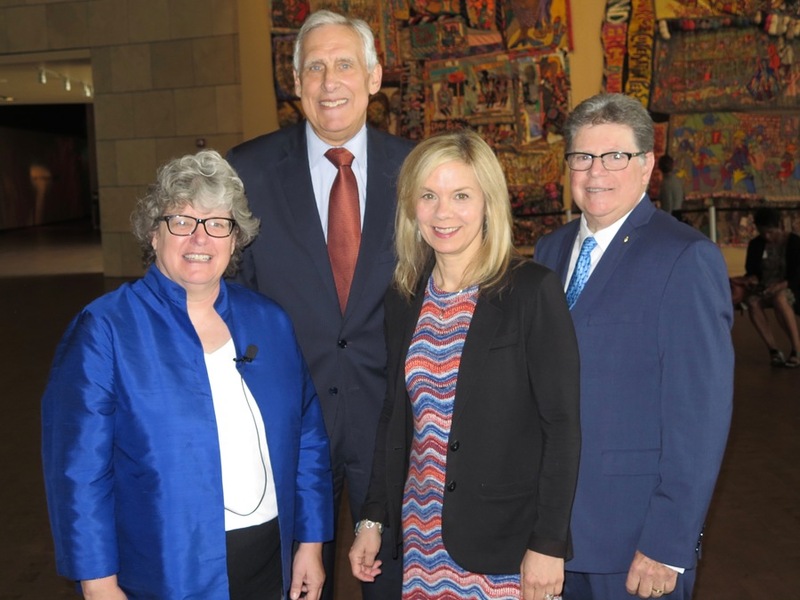 From left, Melissa Brown, Rob Reifsnyder, Ellen Katz and Jim Yunker spoke at the local June 12 Giving USA briefing at the National Underground Railroad Freedom Center. Details from Giving USA 2018: The Annual Report on Philanthropy for the year 2017 are available on the Giving USA website .